Here are the best 8 most popular Free File sharing sites. With the change in time the way we used to share and store data has changed completely. A decade back floppy disk was used. They provided around 3 MB storage space. Then came pen drives, CDs, and DVDs. With all these inventions the storage space increased and became cheaper. Now cloud storage and data sharing websites are the hype at the moment. So why do we need these file sharing websites ? We need them because sometimes it happens that our emails are not able to send large files or we may run out of the hard disk space with the junk files. At this point “free file sharing websites” helps amazingly. The most important advantage of using “file sharing websites” is that hard disk doesn’t get loaded with large number of junk files, either there is need to worry about the files getting lost because they are securely stored on cloud and can be shared with anyone. These websites offer you a plenty of storage for free which can be upgraded at some point. File sharing website allows you to share files privately as well as publicly. Files can be viewed, copied, moved and edited as there are various features and options provided by the file sharing platforms. File sharing websites are very much useful because nowadays internet has become very cheap and easier to access as compared with all physical devices available in the market. Also with your data in internet there is no need to worry about data being destroyed or lost like it happens with physical devices.. In this article I have listed some of the best file sharing websites available for free on internet. Google drive is one of the best file sharing site that allows you to store any kind of file from documents, spreadsheets, PDFs, videos, movie etc. Initially it offers a free 15 GB storage space which can be upgraded later with nominal fee. The uploaded content is shareable with anyone by inputting the recipient’s email address and also with access link which can be shared with their email addresses. A high quality photos and large documents can be shared with anyone and can be accessed by them anytime. It also allows users to edit modify and control permission of the files by making them public or private. Dropbox is one of the popular file upload sites. It lets you to carry your files anywhere and share with any of yours friends and colleagues. The file can also be accessed from mobile application in your phone and Dropbox keeps them synced all across devices. You can upload and share large video file with a person who doesn’t even own Dropbox account and this can be simply done by creating a link to the file that can be send via email, chat or text messages. The set link can also be previewed before downloading. Dropbox keeps your files safe and good. It lets you edit a file with your teammates without emailing them the link and editing is within the shared folder and it gets automatically updated and everyone can see. 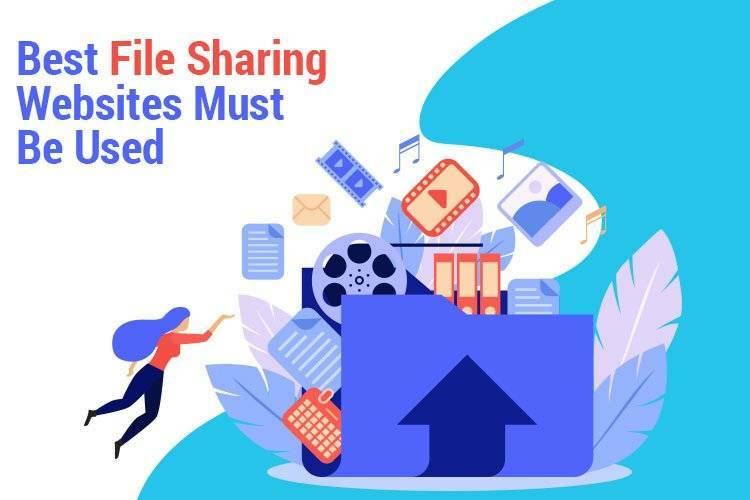 4shared is one of the top file sharing sites that offers free file sharing and downloading, whether the files are pictures, videos, documents, music, files, etc from any of the devices like mobile phones or laptops. The file can be accessed from any device and 4shared automatically syncs the changes all across the devices. 4shared also comes with the feature of browsing files from its massive database and also lets you add filters to your search. Mediafire, a file sharing site like all other file sharing website allows you to share files through email, link or social network with unlimited downloads without any waiting time. You are allowed store and save any file format and share folders of your projects and any large files. This site lets you email heavy files or large files without any issue or delay. Mediafires allows you to store files in 10 GB of free storage. OneDrive among all other is best file sharing website which was previously known as Skydrive. It is a cloud storage service from one the great technology-based company, Microsoft. It enables any user to share the stored files and work together. OneDrive comes pre-installed in Windows 10, letting you to access the files from any of the devices. You can collaborate the platforms like word, Excel, PowerPoint and OneNote from any supported device and you can share them with your employees, co-workers. It keeps file organized and searchable and it provides real-time notification when files are being shared or edited with members. Zippyshare is a free file sharing website that contains no download limits and supports upload large files up to 200 MB. it offers unlimited disc space and there is no need to create an account. The uploaded files can be shared across emails, social media, message. The link can be shared on websites, forums, or any other media. Among all other file-sharing websites, Box is a collaborative and secure file sharing site which is portable and allows accessing your file across any device. The files can be shared with people without worrying about the security and privacy. The recipients are allowed to edit, rename, and create documents in real-time from any device and reshare them without others depending on their permissions. It also offers a number of security controls and customer managed encryption. You can also connect to box to other applications like Office 365, Slack, google APps, Symantec, etc.